Home » charles nelson reilly , cnr , comedy , humor , internet leaks , music , music video , song , weird al yankovic , white stripes » "Weird Al" Yankovic releases "CNR"... a song about Charles Nelson Reilly?! 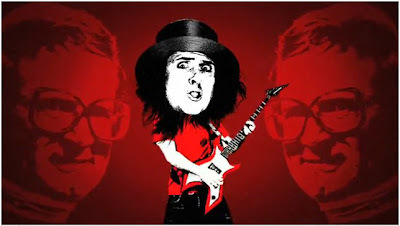 "Weird Al" Yankovic releases "CNR"... a song about Charles Nelson Reilly?! If you're one of "Weird Al" Yankovic's many fans you're no doubt enjoying this summer and Al's "Internet Leaks" collection (one new song and video a month through September). So far we've had "Craigslist" aping Jim Morrison's style and then a number of weeks ago "Skipper Dan". And a short while ago Al released his latest "Internet Leaks" single: "CNR", spoofing the signature sound of the White Stripes. And it's a song about Charles Nelson Reilly, of all people! Mash here for the "CNR" video (created by JibJab) on YouTube. And on the video's page you can find links to purchase the song and video via iTunes and other online outlets.